What’s It Cost for a Custom Home? Your ultimate desires and selections will dictate the cost of your home. Obviously, you can spend considerably more per square foot than it took to build these homes but just as importantly, you can also spend considerably less per square foot to build your home than it took to build these homes. I have also found that many people enjoy preparing their home for certain upgrades to occur in the future, and focus on placing the items in the home during construction that are more difficult to change once the home is built. For instance, it is very easy to replace a tile vanity top with granite in the future, but it is very difficult to add beams and a wooden ceiling in the Great Room four years after the home is completed. 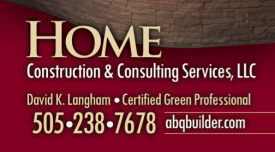 To the right is the cost-per-square foot for the last few homes that I have built in the Albuquerque area. These homes all have very nice finishes with beautiful features and accessories some of these homes have photographs on this website and are very nice Custom Homes exactly what the clients desired and were dreaming of, and in some cases, more than the client thought they could get. These costs exclude the cost of the land but do include all costs of construction, to include Builders Fees and all Gross Receipts Taxes. 2,958 square feet heated at $175.82 per s.f. 3,018 square feet heated at $151.64 per s.f. 3,640 square feet heated at $122.17 per s.f. 3,602 square feet heated at $139.25 per s.f. 2,368 square feet heated at $137.25 per s.f. 1,815 square feet heated at $246.72 per s.f. 3,322 square feet heated at $128.54 per s.f. 3,349 square feet heated at $129.24 per s.f. 2,904 square feet heated at $123.77 per s.f. 5,022 square feet heated at $147.99 per s.f. 2,948 square feet heated at $143.46 per s.f. 2,548 square feet heated at $122.45 per s.f. The following are some sample sections from a budget. Every item is delineated and the Builders Fee to construct the home is listed approximately eight lines from the bottom of an extremely detailed budget designed specifically for your home or project. The budget numbers are actual costs to do the work, there is no fluff in these numbers, you will be welcome to ask some of our past clients about their experiences. Every budget has extensive notes that discuss every line item. Yes, you should know exactly what the builder is earning and what they are doing to earn that money. When building a true custom home, it is impossible to provide an exact dollar figure of what it will cost to build your home until the plans are drawn, the finish schedule is created and/or discussed and the various items included in the construction process are bid out. It may be possible to provide a very rough estimate of what it may cost to build your home, but it will not be accurate estimate. Every home that I have ever built, remodel that I have ever undertaken or addition that I have ever done has had a very through and detailed budget created that is very specific to exactly what it is that the client desires. The only limits as to what you may want in your home are dictated only by your own personal taste and budget. There are no, nor will there ever be, any “pre-selected” items for you to choose from. I will provide you advice and help you in making selections, but the decisions are yours. Budgets for new home construction, on average, are approximately four pages long and are created on an Excel spreadsheet. The more accurate and detailed the budget is, the less likely the chance of going “over budget” and the happier your lender is going to be, as well as yourself. Detail entails everything from the big numbers, such as the cost of a lumber package, down to the little numbers, such as how many door bumpers will be in the house and how much will they cost. Everything is line-itemed and it will be possible to project to the dollar what it will cost to build your house as well as tell to the penny what has been spent on your house. The numbers truly do the talking when budgeting. Even when building a speculative home for myself, the home is first built on paper before a shovel is ever taken to the dirt, so to speak. Personally, I must know what a home is going to cost and I refuse to go over my budget and I am even more picky when it comes to working numbers for a client. For this reason, I can assure you that you can always find a lower bidder for your home. However, I can also assure you that you will not find a more accurate bidder for your home. Clients never enjoy exceeding their budget. As a builder of homes for myself, I refuse to go over budget and banks are always happiest when their customers stay within budget. Yet for some reason, a fair amount of the horror stories that are heard about building concern homes that went significantly over budget. The numbers do the talking and they must be listened to. You may decide during the construction process that you would like to spend more money than you originally intended, possibly you fell in love with a floor tile that is more expensive than the one that you had previously selected, and that is normal and to be expected. We will plug the new numbers into the budget and see how they affect the bottom line. Additionally, your budget will have been originally created with a specific account that will grow and shrink throughout the construction process. We will always be able to track additional monies that you may have to spend without causing you to exceed your budget. There are various levels of involvement that can we can discuss prior to the commencement of construction of your home as to what the “builders fee” will be. Obviously, the more involved that the builder is and the less involved that the client is, the higher the fee will be to build your home. Well, a situation such as that will cost you somewhere in the neighborhood of seventeen to twenty percent of the cost of construction of your home, excluding the land, as the builders fee. The opposite end of the spectrum may be that you pull your own permits as a homeowner-builder, you do all of your own bookkeeping, you select all of the subcontractors (or want minimal help in selecting them), the builder does not warrant any of the work and the builder is acting purely in the capacity of a project manager or a consultant. In other words, you are using the builder as a person to coach and guide you through the construction process of your own home because you want to save some money and you are capable of tackling the project yourself. Well, obviously, this will cost significantly less than if the builder were doing everything. In fact, it will cost a predetermined average number of hours per week at a predetermined hourly rate. On average, in the Greater Albuquerque Metropolitan Area, you should expect the builders fee for your new home to run somewhere between ten to twelve percent of the cost of construction, excluding the land cost. In the Santa Fe area, you should expect the builders fee for your new home to run somewhere between fifteen to seventeen percent of the cost of construction, excluding the land cost. As previously mentioned, the budgeting process is very detailed and inclusive so it is very easy to see exactly what things cost. Additionally, no matter what the arrangement is as to the level of service that you desire in the construction of your home, you will always receive copies of all invoices, and bank statements and Quicken accounts in the event that is required. You will know exactly how much your home costs and how much the builder earns. All negotiated discounts, be they with vendors, suppliers or subcontractors, are passed on directly to you, the client. I, the builder, earn my money by building your home, to the level of service that we agree upon. I do not earn my money by marking-up plumbing fixtures, flooring material, windows, or anything else. I get paid to build your home, and I get paid to save you money. Bottom line, “what it will cost to build your house” will be greatly influenced by what exactly you want in your home, how you want your home to look and they types of finishes that you desire to have. What you will pay the builder to build your house will be agreed upon between you and the builder and be something that you are both comfortable with and believe is fair, and yes, you should know exactly what the builder is earning and what is being done to earn that money.